We were recently asked by luxury travel site Destinology for a recipe that takes inspiration from our travels. Having honeymooned in Barcelona and Madrid, and also spent time recently in Valencia, for us, it had to be a Spanish inspired recipe. We did a lot of foodie things on these trips, from food tours in Madrid and Valencia, to wine and tapas in Barcelona, so it’s fair to say we had plenty to choose from. While we had many food memories from these trips, one stuck out for us and that was a special honeymoon meal we enjoyed in La Vinoteca Torres Restaurant in Barcelona. 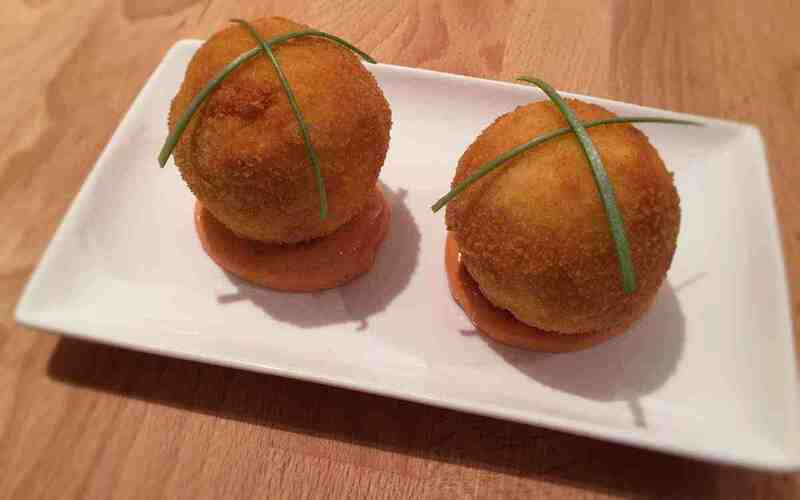 With some amazing wine on offer, we started with some tapas that included spicy potato and sausage bombs. We’ve decided to do our own version of these below. 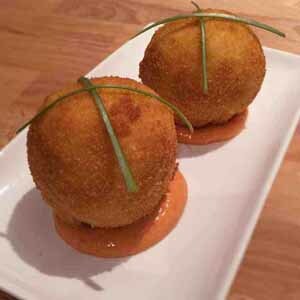 Perfect for an evening meal or part of a tapas menu for a party with friends, these ‘bombs’ certainly have a bit of a kick! Peel and wash your potatoes and cut into medium chunks and cook in boiling salted water for 15-20 minutes until soft. 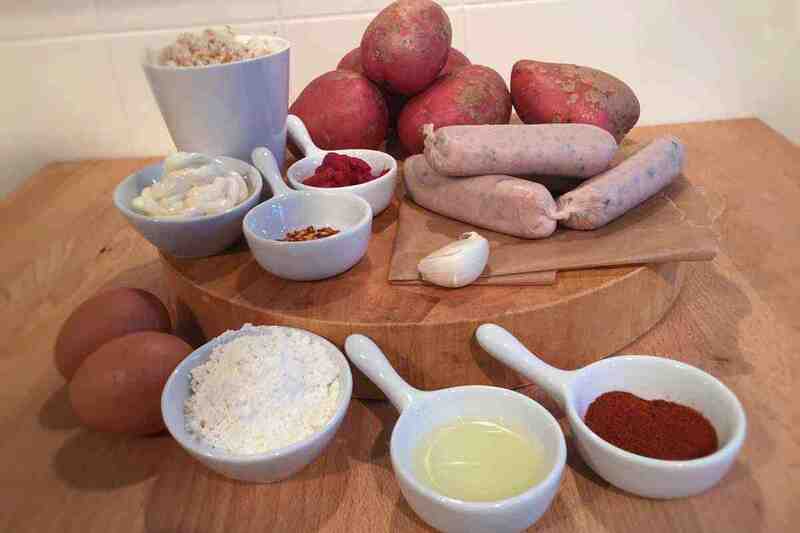 While the potatoes are cooking, prepare your sausage mix (see step 2 below). Once the potatoes are cooked, drain and mash them and set aside to cool. Squeeze the sausage meet out of their casings, into a bowl and add the crushed garlic, sweet paprika and chilli flakes. Season with a little salt and pepper and mix thoroughly with a fork. Gently fry this on a medium heat with a splash of olive oil for around 10 minutes until fully cooked. 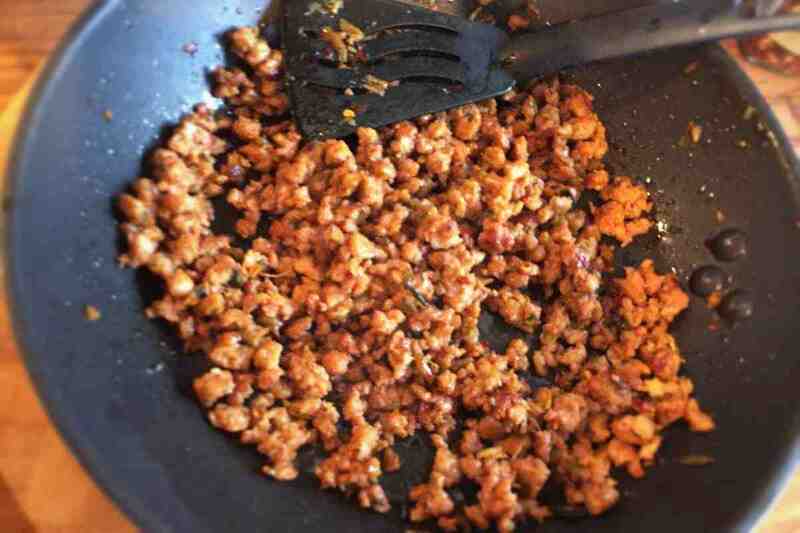 Make sure to break the meat mix up as it cooks, until it resembles a minced like texture. Once cooked, set aside until your potatoes are ready. Once your potatoes have cooled, season with salt and pepper, add 2 eggs and mix well. Now it’s fun time as you begin to assemble the bombs. Firstly, spoon a large amount of the potato mix into the palm of your hand and then fill the centre with the sausage mix. Mould this into a circular shape ensuring the potato is on the outside and the sausage meat on the inside. Once the bombs have been created, set them aside until they are all ready to be crumbed. With your sausage bombs ready, all that remains to be done is to crumb them and fry them. Put your flour, remaining eggs and breadcrumbs into 3 separate plates, and roll each potato bomb in flour, then coat with egg and finally cover with breadcrumbs. Once the potato bomb is fully covered, add it to a deep fryer (170C – 180C) and cook for 3-5 minutes until golden and crispy. You may need to turn the bombs in the oil to ensure an even fry 0 be extremely careful. Remove and enjoy with our spicy mayo dip below. Add the mayonnaise, tomato puree, sweet paprika and lemon juice into a bowl and mix together. Serve a dollop of this on a plate and set your spicy potato bomb on top. Garnish with some chives and enjoy. Have you got any food memories from time spent travelling around Spain? Is there a particular Spanish destination you’d recommend we visit? We’d love to hear your thoughts. Please share by commenting below or connecting with us on Facebook and Twitter. 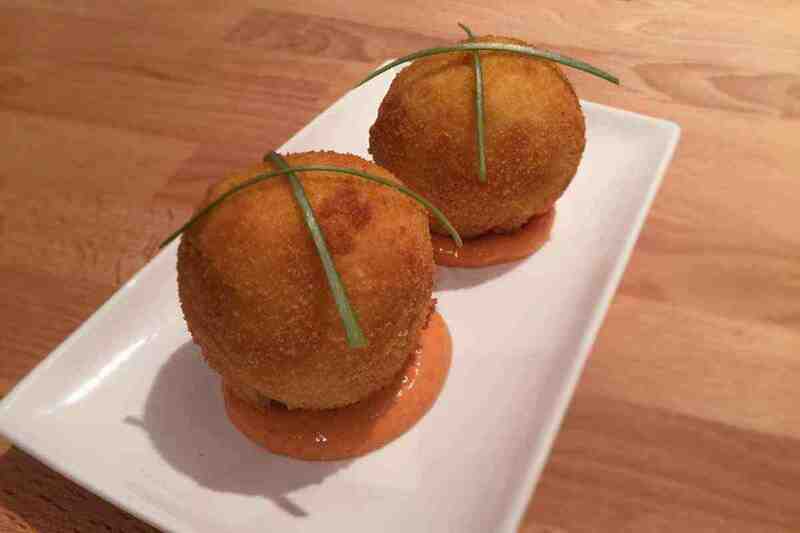 Here’s a quick video to show you how to make these Spanish Spicy Sausage & Potato Bombs.